Ananka's Diary: Now That's What I Call Talent! Nine-year-old Tiana Walton has used an unusual skill to break into the Guinness Book of World Records. 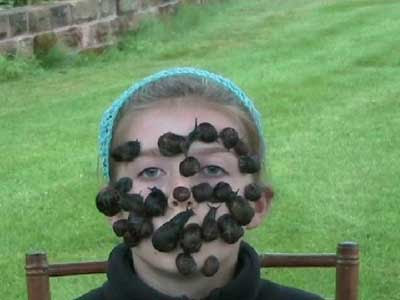 She now holds the world record for balancing snails on her face. Just how many did it take to shatter the previous record held by Australian Liam Kenny? TWENTY-FIVE! All I can say is . . . do not try this at home. Read more and see a video masterpiece here. Snails are so cool. And snail-balancers. But... snails are sticky! They have the whole gastropod suction slimy walk-up-walls thing going on. Wouldn't they stay on by themselves? Admittedly I never tried on my face, but they stick on my hand well enough. That's sweet! I love snails! It's kinda funny, because the to different talents are completely different. yuck! could you show a pic of the very large lemon?